Having spent a fair amount of time driving around London over the last few days, one thing is evident: Comes With Music, Nokia’s all-you-can-eat music service, has definitely launched in the UK, backed by a costly ad campaign and a big holiday season push by retail partner Carphone Warehouse (prime time TV ads shown during X Factor, if I recall correctly). But how well is the message getting through? On that note, I decided to pop into one of Carphone’s larger stores to take a closer peek at the display advertising for Comes With Music — there was plenty of it — and to ask a few subtle questions about how well the concept is resonating with consumers. 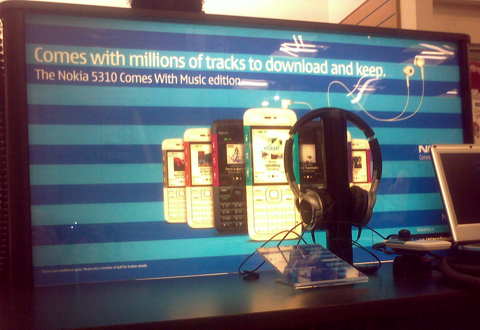 I counted three sections of display advertising for Comes With Music throughout the store, with two featuring a demo area where you can actually listen to the Nokia XpressMusic 5310 handset and try out the PC software used for “side loading” music onto the phone. However, during the 30 plus minutes I spent in the store, I didn’t see a single customer pick up the connected headphones or even play with the device. Interestingly, the only other handset to get its own hands-on demo area was Apple’s iPhone. Carphone Warehouse offers the entry level Comes With Music handset on both a pre-pay (“pay as you go”) basis or with a fixed contract on “3” mobile, but it’s the former that’s being pushed hardest, pitching it as an ideal Christmas gift. There are actually four pre-pay Comes With Music bundles on offer, ranging from the basic handset and service, to a package that also includes a docking station/speaker, case and higher capacity memory card. So how well is Nokia’s Comes With Music selling? The customer rep I questioned said that it was generating quite a bit of interest, and that, unsurprisingly, it was the pre-pay version that was selling best. After a bit more probing on my part, he did concede that the Comes With Music concept wasn’t something that all customers understood, but that those who did are helping to spread the word. 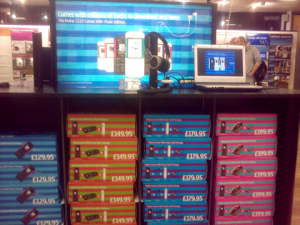 As Nokia’s message percolates, our helpful rep expects sales to ramp up nicely as we approach Christmas. Just as I was about to leave the store, I couldn’t resist asking about how well the Google phone was selling. Not too great, said the sales rep, especially compared to the iPhone 3G, which was still doing well. He’d personally sold 3-4 iPhones in the last few days but couldn’t be sure if he’d even shifted a single G1, although he did partially attribute that to T-Mobile’s more stringent customer credit checks. 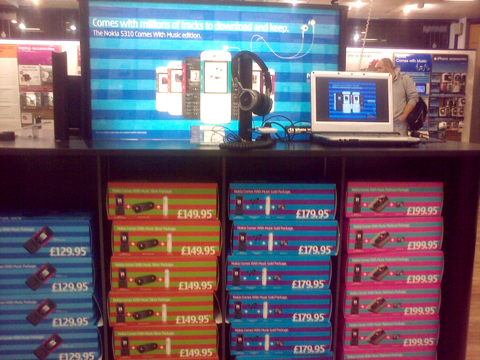 Of course, neither Google or T-Mobile have launched a UK-wide advertising blitz on anything like the scale of Apple or Nokia, and aside from one broken dummy unit on display, in-store advertising for the G1 in this particular Carphone Warehouse was non-existent, which perhaps also tells its own story. Nokia admits mistakes over UK launch of "Comes With Music"